Rosemarie Garrity-O'Brien. Photo Courtesy: Rosemarie Garrity O'Brien. I first had the pleasure of meeting Rosemarie Garrity-O’Brien in October, 2017 when she was a judge at the Flaming Star Festival. 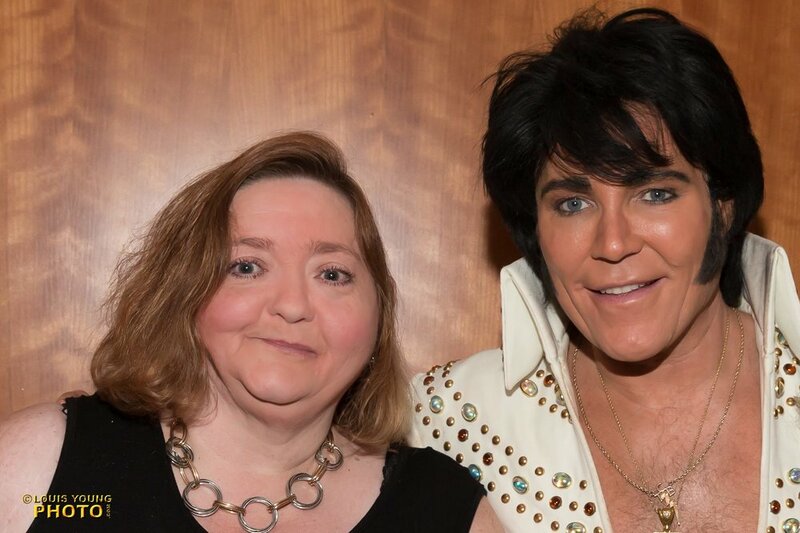 Several months later, we met again at the Niagara Falls Elvis Festival in April 2018. I am delighted that Rosemarie agreed to be featured in SIDEBURNS Magazine. Rosemarie’s bio and CV are a treasure trove of information that outline her experience, education, and volunteer work. 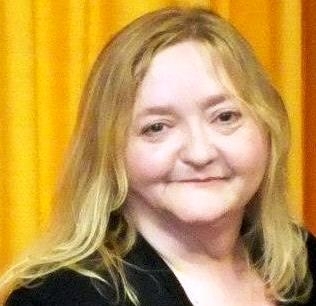 In her interview answers, Rosemarie shares heartfelt moments from her past and graciously recognizes the contributions of others connected to the Collingwood Elvis Festival. Rosemarie Garrity-O'Brien with ETAs Justin Shandor and Di (Diogo) Light, and Cathy Korsakas at the Niagara Falls Elvis Festival. Photo Credit: C.M. Image being at an event the size of the Collingwood Elvis Festival that attracts thousands of visitors over the weekend and losing your car keys somewhere in the sea of people. Imagine, also, that not only do you need your car for travel, but it is where you will be spending the night. This true story happened to dedicated ETA fan and friend, Dot Farr, during one of her many trips to Collingwood for the Elvis Festival. What Dot remembers most about that day is the not the worry over her lost keys, but the kindness shown to her by Rosemarie Garrity O'Brien when she stopped by Rosemarie’s office to report her lost keys. Rosemarie made Dot a cup of tea and arranged a phone call to a local dealership to see about getting a new set of keys. Dot remembers Rosemarie as being a caring, kind, and concerned individual during a very stressful day—a day when dozens of others also needed Rosemarie's attention. From Dot’s story we can see that those who attend the Collingwood Elvis Festival, whether as a guest, a judge, or an ETA, all are in good hands with Rosemarie Garrity O’Brien at the helm. On behalf of everyone, Rosemarie, thank you, thank you very much. Best regards, Carolyn. Living in the Collingwood area since 1973 after relocating with her family from Brampton, Ontario, Rosemarie has been involved in the growth and development of the Collingwood Elvis Festival since 1998 when she began as a volunteer while working with the local Chamber of Commerce. Employed in 1999 as the Office Clerk for the Festival, Rosemarie was later promoted to Office Manager in 2001 and then Festival General Manager in 2003. Rosemarie currently holds that position while working with the Town of Collingwood for the past 10 years continuing to improve and develop the event each year. The Collingwood Elvis Festival is now internationally recognized, and is the largest event of its kind in the world. Among her other experiences, Rosemarie is a graduated law clerk/paralegal by trade and has been in the entertainment industry as a singer/songwriter and recording artist for almost eighteen years. Also among her achievements is being one half of Creative Gal Productions, an entertainment production company Rosemarie formed with her friend and colleague, Elena Chisholm, in 2012, that offers unique entertainment opportunities in a variety of entertainment genres, and in various locations throughout the province. Rosemarie also lends her experience and event expertise as a consultant for new festivals, as a speaker for workshops on Sponsorship and Event Planning, and as the current Vice-President, and Awards Chairperson, for Festivals and Events Ontario. Rosemarie enjoys working with the public while being able to utilize all her skills and experience in her management position. She is married to her husband of 12 years and still resides in Collingwood, Ontario. Q. What is your official title with regards to the Collingwood Elvis Festival? A. I am the Festivals Co-Ordinator for the Town of Collingwood. I cover all Festivals, including Elvis. Q. What do you consider your greatest challenge in organizing the Festival? A. The greatest challenge is scheduling all the programming and the contest rounds without conflicts for the ETAs. Timing is tight throughout the weekend since we offer so many events. I want to make sure that the information is accurate and that everyone has time to get to an event, and still has time to enjoy some down time or a great meal at one of our many incredible restaurants here in town. Q. How has the Festival changed over the years that you have been involved? A. The Festival has become more than just an event. It has become, rather, for some fans, a summer vacation getaway, or a trip that is fulfilling an item on their personal bucket list. The Festival is more interactive and experiential now than ever before. Rosemarie Garrity O'Brien and ETA Gordon Hendricks in Niagara Falls. Photo Credit: Louis Young, Louis Young Photography. Also, it has become an internationally recognized award winning event that is considered a valuable tourism draw to the Province of Ontario. These are all great things and worthy accomplishments over the history of the Festival. Q. What is your favourite part of the Festival? A. I definitely enjoy the Storyteller Chat event as I love to speak to the fans, and the format is very impromptu, fun and energizing for me. Also, I adore the Saturday night signature shows because I develop the show theme, and I have a great team who work with me to develop the content and scripts. Q. Who are the people you would like to recognize and/or thank for their contributions to the Festival’s success? A. I don’t think you have enough article space to list that many people, but I will try to narrow that down. First, credit must go to ETA Billy Cann for the entire concept of an Elvis Festival in Collingwood. Without his original idea this event would never have happened. And thank you to Karen Burland who thought the event had potential to become a town event and was the first Festival Manager. Next, thank you to Yvonne Prince, the late Gary Zieman, Alex Yuen & Cheryl McMenemy, Will & Carol Chalmers, Bill and Sue Nicholson, and Greg Goldsworthy, who were some of the original folks who worked so hard to build the festival bit-by-bit, all of whom I can still recall were out sweeping streets on Sunday night at 2:00 a.m. It was a big undertaking then, and is a huge undertaking now; but without their initial time and hard work, this festival would never have become the success it is today. Besides, had it not been for some of those great folks, I would have never been hired to manage this incredible Festival that I have now been with for 20 years. Later though, thank you to Peter Dunbar and the Town of Collingwood Mayor(s) and Councillors for following through with it year after year. It has definitely made Collingwood famous for more than just skiing. There is virtually not a corner of the world that does not know “Collingwood is home to the Elvis Festival”, and that it generates millions of dollars in economic impact to the region. There are so many people to thank, but I would like to mention a few that were by my side, volunteering every year, and saw me through a lot of joy and stress. My heartfelt thanks to Lucy Seaborn, Ann Farrell, Diana Brock, Margaret Forsythe, Denise Forsythe, Brittny DiScola, Maryann Barrie, Mitch Brock, Judy Wagner, Elena Chisholm, Cathie Korsakas, and of course my husband, Ralph O’Brien, who hardly ever sees me for the four months leading up to the festival. Lastly, sincerest thanks to my current team members working behind the scenes who never get the recognition they deserve, including Karen Cubitt, Chris Stoutenburg, Michelle Kusiar-Findlay, Amanda Norris and my boss, Dean Collver. Q. How do you relax during your hectic schedule in the weeks prior to the Festival? A. I listen to music, play internet games or watch movies on my tablet at home and sleep as much as I possibly can. Q. What are the best and worst parts of being an ETA judge? A. Judging is stressful, time consuming, and relatively thankless because no matter how focused you are, how much you know, or how unbiased and fair you can be, there will always be winners and losers, hurt feelings and wounded pride among the ETAs, as well as disgruntled or discouraged fans who had other ETAs chosen for the win in their minds. Those would be the hardest parts because you go into judging knowing that you can’t be perfect and that you can’t please everyone! The best parts of judging would be the pride you can take in knowing when “you got it right”! When you paid attention to detail and the outcome justified the time, energy and honesty that you put into it, and when you can take some personal satisfaction and pride in knowing the right ETAs came through on top. There will never be perfect judges. They simply don’t exist. There is no one out there who can know every outfit, every lyric, every movement, every hairstyle, every nuance of Elvis down to the slightest detail, so we (the Festival) must trust that we have selected judges that have reasonable Elvis knowledge and experience, who will be fair, unbiased and dependable. That’s all any Festival with a competition component can ask for. Rosemarie Garrity O'Brien and her Tweed friends. Photo Credit: Louis Young, Louis Young Photography. Q. What advice would you offer the ETA contestants who are competing at the Collingwood Elvis Festival? A. Select your competition songs carefully. Don’t choose the songs you like, but rather choose the songs you do well and that showcase your voice and appeal. Not everyone can sing every song. Watch and learn from the Ultimates and the headliners who have taken their careers to the next level. They must be doing something right, so take pointers from the best in the business. Q. Please describe some of the highlights of your own singing/song writing career. A. Wow! That was an unexpected question. I would have to say there were a top 5 for me. 1. Performing in South Carolina because it was the first time I actually heard my name announced on radio and I almost crashed my car into the guardrail. I was treated like a superstar at every venue I played in. It was amazing. 2. Being the opening act for the legendary Ronnie Hawkins, not once but three separate times. He is a fascinating person and quite a character, but I was quite honoured to be asked. 3. To have the late Rita McNeil perform my song on her television show. The song was “I Believe in Miracles” and it was something I co-wrote with a recording artist friend named David Walsh. It was a thrill to later meet Rita and become her VIP liaison when she performed in Collingwood. She was a beautiful person and I thanked her for singing my song and when she was presented with roses from the Town at the end of her performance, Rita passed them on to me and thanked me for the privilege of singing the song. My heart melted on the spot! 4. When I was asked to come to the bedside of a terminally ill child and personally sing “I Believe in Miracles” to her at her parents request, because it was apparently her favourite song. What an honour and immense privilege that was, but what really got to me was that several years later I met her mother on the street and she stopped me to tell me that her daughter had passed away but had made a bequest in her Will that my CD be given to another terminally ill person. Her mother told me that her daughter said my song had brought her hope and she wanted someone else to be able to hold onto that feeling. I literally broke down and cried right there. It doesn’t get any better than that! 5. My first time in a recording studio, I was so nervous, but so excited. I recorded at Canada’s Studio of the Year, MetalWorks Studio, operated by the legendary band Triumph, and it was an amazing experience. I truly thought I was going to either throw up or pass out. All the people there were fantastic and made me feel very comfortable. The engineers even danced in the studio while I was trying to record and it took several takes because I would laugh watching them instead of staying focused. I was never going to be a superstar and I was alright with that. Music was fun and I made a lot of fans who became friends and worked with some incredible people in the music industry. I can honestly say that I have not had a single regret, and not many have the luxury of saying that in their life. My thanks to Sideburns Magazine and its staff for asking me to be interviewed. It was fun and allowed me the opportunity to revisit some memories that I treasure and to finally thank those who have made a difference in my life and career history. This was fun!